Lee Jong Suk finally met his fans in Indonesia for the first time through fanmeeting last weekend (November 3 rd 2018) at The Kasablanka Hall, Jakarta. His visit to Indonesia was a part of Crank Up Tour 2018. Lee Jong Suk opened the fanmeeting with his appearance, and continued it with Question & Answer session. During the Q&A session, he kept telling us how he loves Indonesian fans’ enthusiasm and it was very surprising for him. Besides his impression of Indonesia, Lee Jong Suk also talked about his daily food. He told us that he loves Nasi Goreng (Indonesian Fried Rice) and he ate it a day before the fanmeeting along with Sushi and Kimbab. Although he is known as ‘someone who eats a lot’, he has to hold back his crave of foods because of his next project. After that, he was asked to share about his fashion style. He answered that he doesn’t have any typical style, he only believes in stylist to choose all the outfits for him in any occasion. He picked training pants and jumper as his daily style. Best scenes of most dramatic and most romantic from his dramas were also sho(wed during the fanmeeting. Lee Jong Suk opened up about the filming process from each scenes which was shown on screen. He confessed that there is no preparation when he was going to do the sad scene or romantic scene. “Just do it!” he said. Lee Jong Suk also chose ‘W’ as his favorite drama because of its unique concept between two different world, which is webtoon and real life. After the Q&A session ended, we move to the next session which is Yes or No Q&A. Is there any cute name if you have girlfriend? Confessing love by yourself or getting confession by the woman? If there is a friend of yours likes the same woman like you do, (will you) choose the friend or the woman? Do you believe in ‘Love at the first sight’? Is it hard for you to be in relationship with someone that has different taste of food? He also gave some spoilers about his project plan for the new drama, ‘Hymn of Death’. During the fanmeeting, an unpublished teaser of ‘Hymn of Death’ was shown. As we already know that Lee Jong Suk is going to star his first rom-com drama with Shin Hye Sun as the female lead. Lee Jong Suk will be playing as Kim Woo Jin, a genius writer in the drama. Lee Jong Suk agreed when he was asked about taking the drama with no guarantee pay as well. “I have been a fan of the PD since previous projects, since I want to be in a same project once again, I have to take the chance” he explained to us about his close relationship with ‘Hymn of Death’ PD. He reminded us to watch his new drama which will be aired its first episode on November 27th 2018. 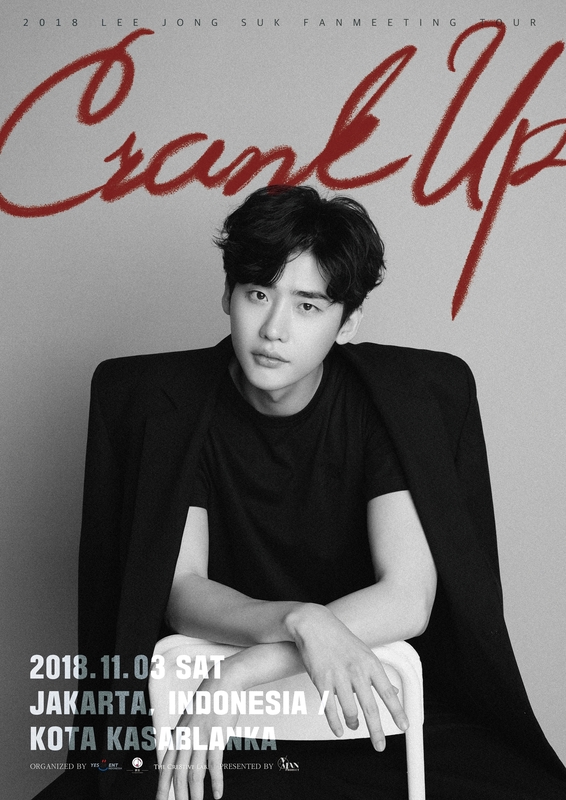 Lee Jong Suk continued the fanmeeting with his performance with piano, singing to one of the ‘While You Were Sleeping’ OST – ‘Will You Know’. He told us that he had been preparing the performance for Indonesian fans although he said that he was nervous a lot. The long wait is over, finally games time with fans who attended the fanmeeting. Nine lucky fans were chosen by a lucky draw on stage. The lucky fans played the ‘Guessing the word through drawing’ game with Lee Jong Suk. After the games ended, Lee Jong Suk expressed his gratitude to all fans. “I’m going to remember this moment and cherish it for a long time, I don’t really know when I can visit Indonesia again, but when the time comes, I really want to come to Indonesia again”. After taking a photo group with all fans, he closed the fanmeeting by singing to one of ‘While You Were Sleeping’ OST – ‘Come to Me’. He also sang to Roy Kim’s song – ‘Only Then’ as the encore song before the show was officially ended. We would like to thank YES24 for the invitation to witness another memorable event through #CrankUpinJKT.